Are you any good at planning? I’m not and I don’t mind admitting it. I’ve never had a personal five-year-plan or even a plan for a particular month, let alone a whole year. I’ve always preferred to wing it, to ride life’s ebbs and flows and see where my luck, or lack of it, takes me. Sometimes that’s worked, sometimes it hasn’t. Now my life is my business, a business that my daughter and I depend on for our livelihood, so I can’t take that chance. This year I need to both cement and grow my business, so I have to make sure I focus on the right activities – activities that build intention. This being my first year out of a corporate job I hadn’t quite got to grips with the fact that ALL the planning is down to me. I’m not just the content marketing persons, I’ve got to set overall business goals, revenue targets, and budgets too. Yikes! This year I get to say what the goals are. I get to decide what’s happening and when. Exciting but daunting. So that’s why I’ve been a bit quiet of late. I’ve been focussing on planning my year. To help me on my way I’m using a combination of powerful tools to help me get off planning ground zero and build a roadmap to success – success on my own terms. Each tool has a different role to play in the process, because none of them cover all the bases. I need digital, analogue, short-term, long-term, visual and financial. The first step was to get clear about my vision for the year. I’m in Jo Gifford’s Next Level Labs programme and one of the first tasks I completed was creating a vision board. It’s a visual representation of what I want to achieve in 2016 – both for my business and personal life. It’s up on my wall in next to my workspace to remind me of my WHY and to help me stay the course when the going gets tough. Which it already has. I kicked off this year feeling despondent, exhausted and burnt out because after spending the last half of 2015 working every hour I could to get my business off the ground, when I relaxed over the holidays it was soooo hard to wind myself back up again. Picking up the momentum has been a hard slog. That’s where the vision board comes in. I’ve set goals I’m excited about, goals that I can visualise, which has helped me get me back in the swing of things, knowing I’m working towards a better lifestyle for myself and my daughter. Once I had some clarity about what I wanted to achieve, and specifically what income I wanted to earn, I’ve delved in deeper to my financials by planning my income month by month using this revenue planner that you can grab from Tara Gentile as a free download in return for joining her list. It’s perfect because it’s helped map out where my money is going to come from this month, next month and every month after that. I can’t live from month to month wondering how I’m going to pay the bills because I know I won’t make sensible decisions from a place of scarcity. OK, so I haven’t actually found a wall planner that rings my bell yet but I’m on the look-out. If anyone has recommendations, please shout. I like the look of this one. For now I’ve stuck up what I’ve written into Tara’s plan onto my wall so that I can see my whole 2016 plan at a glance. The next step is adding in the detail so that I create a content and marketing plan that supports the activities I’ve planned for each month. I NEED to be able to see my whole year planned out in front of me so that I can be reminded of the path I’m on, what’s coming next and what my priorities are. Otherwise I’ll end up wasting time on activities that aren’t taking me closer to my goals. I’ve broken down each goal even further using ‘my beautiful Passion Planner’ as I refer to it. I was lucky enough to be given this as a gift by my awesome business coach, Heather Thorkelson, and it’s really helping me prioritise what I’m working on to make sure I’m staying true to my plan and to what matters most. Otherwise I tend to get lost in the details. The planner helps you choose what is your most important project each month and then break that down into bite size chunks you can schedule into your week. I sat down with my planner at the start of the month to translate what’s in the annual plan into actionable goals for the month, and every Sunday night I plan my week ahead. Everything goes into the schedule, including my meal plan, my daughter’s schedule, as well as my work schedule. Then every evening I write down my three most important to-dos for the next day so that I start the next day with clarity. The idea is that as each day, week and month progresses you are making sure you focus on the tasks that will take you closer to achieving your goals, and not getting distracted by all the other noise we all have around us. I’ve struggled to find a digital project management system that works for me. Last summer I set up all my projects and processes in Asana but I struggled to keep up with it, and found it frustrating that I couldn’t see everything in one view in a format that made sense to me. Keeping it up-to-date became too time-consuming so I ditched it and tried out Google Keep for a while, but for some reason that didn’t grab me either. I decided that maybe I simply didn’t need a digital tool, but lately I’ve felt like there’s a gap in my process – I need somewhere to brain dump the random thoughts, tasks, hopes and dreams that I don’t have anywhere else to put, somewhere that enables me to then organise and schedule them into my plan – or dump them if they don’t fit. Last week one of my business crushes, Gemma Went, published a post about how she’s using Trello to plan her business this year. I have to admit I took a look at Trello when I first signed up to Asana, but I didn’t get it. Turns out I needed someone like Gemma to explain it to me. Seeing it in action helped me grasp it flexibility and capabilities. What made me sit up and take notice of what Gemma had to say was that she designed her system for Trello based on her experience of using the Bullet Journal system. I’ve been bullet journaling for a long time, and I loved it (I’ve only stopped bullet journaling because the beautiful Passion Planner arrived in my life). So how Gemma has set up her boards makes perfect sense to me. I’ve now created my own boards in a similar way to Gemma suggests in her excellent video guide to see how I get on with it. Unlike the bullet journal it has the advantage of being able to forward plan, and to drag and drop all the scattered tasks, notes and items around as and when you like. Plus eventually I can share it with any team members I bring on board. I’m going to try it out for a while to see if it works for me. If it does then I’ll fork out for the paid version so that my boards look as pretty as Gemma’s do! 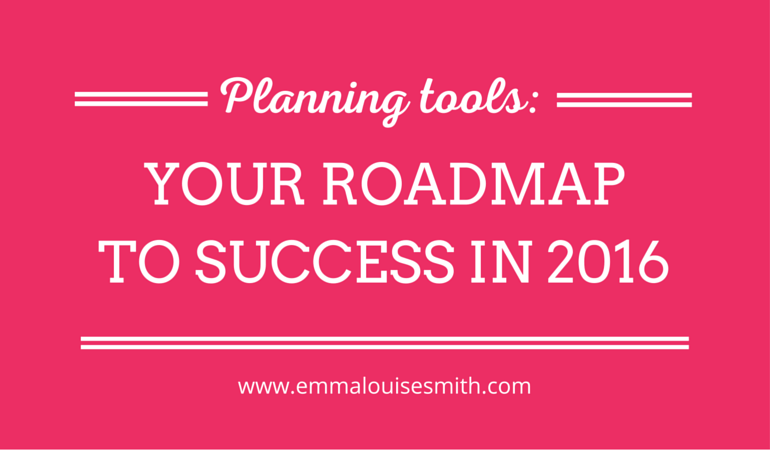 What planning tools do you use to turn your goals into action? I’d love to know. Tell me about them in the comments. Here’s to planning a stellar 2016. Just checked out! Really helpful, thank you.